Hey Lauriel: Congratulations on your 5th finish with this very strong contender for the top honors. Very nice shot, congrats on the 5th place! Message edited by author 2006-11-03 06:19:49. Message edited by author 2006-11-05 21:11:30. Nice contrast Nice Sky. I like the combination of contrast in the sky and the lighting on the field. Nice composition, especially the track line curving around toward the sunset. Hands down, my favorite picture in this challenge, including my own. Bravo! Nice lines, and good composition. a bit more contrast on the track would enhance this IMHO. 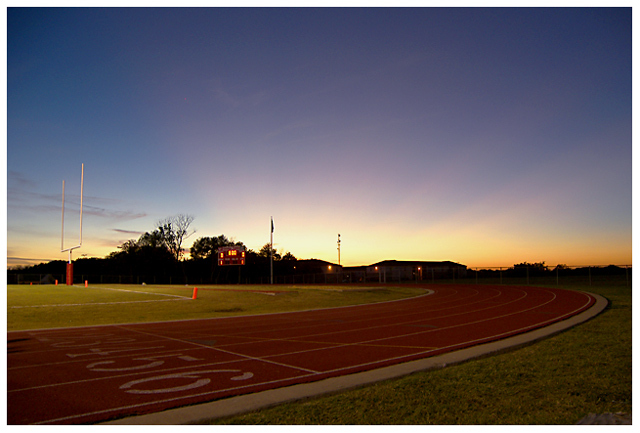 This is the shot I wanted to use, but there were still people in our stadium at sunset. Nice colors. Very pretty. I almost missed the scoreboard. Touchdown but on the foreground there is a track. perhaps the football field is too much on the background and far from the main subject(or better, that than I understand to be the main subject). the photograph is good, with a good composition and colours. before or after the game ? Proudly hosted by Sargasso Networks. Current Server Time: 04/24/2019 06:28:55 AM EDT.